Traumatic paraplegia is caused by a lesion of the spinal cord which occurs after a trauma, e.g. vertebral fracture causing a puncture to the spinal cord. The spinal cord is connected to the brain, where it descends down the middle of the back, surrounded and protected by the bony vertebral column. 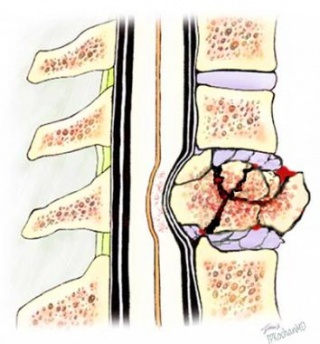 The spinal cord is surrounded by Cerebral Spinal Fluid (CSF). Its function is to prevent the delicate nerve tissue from the inside of the vertebrae. The spinal cord itself consists of millions of nerve fibers which transmit electrical information to and from the limbs, trunk and organs of the body, to and from the brain. The Central Nervous System (CNS) consists of the brain and spinal cord. 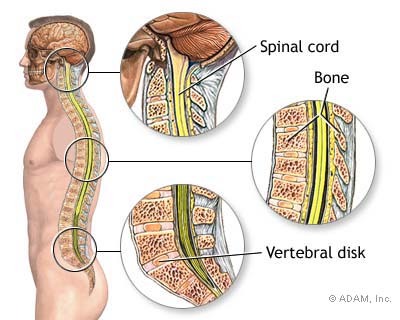 The nerves connecting the spinal cord to the body is called the Peripheral Nervous System (PNS). 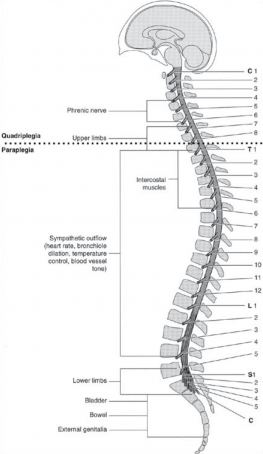 The cause of paraplegia due to a spinal cord injury is most often by a car accident. It can also result from a firearm injury, which is not the case in many countries in the world. Traumatic paraplegia is most prominent in young men between the ages of 21 and 35 years. The more reckless way of driving within the younger population could also be one of the reasons. This injury has a major effect on the social life of the patient, such as divorce or loss of work. Therefore, it might be important as a physiotherapist to talk with the patient about considering professional psychological help and assist in guiding him/her through this process. Like every injury complete immobilization should be prevented. It has been shown that an intensive physical training program of 10 to 15 weeks could make the patient climb and go down 20 standard stairs and be able to walk 100 meters indoors with crutches for example. It is highly recommended not to be independent of a wheel-chair and try to be mobile as much as possible. Intense and regular therapy for spasticity, including physiotherapy, can delay and minimize the appearance of these complications named above. Understanding the Changing Health Care Needs of Individuals Aging With Spinal Cord Injury.